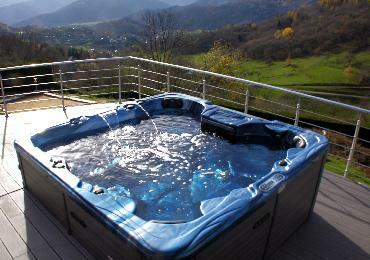 Vacation Rentals & Holiday Rentals in France : Chalet Oderen. 1000gites.com vous propose des rentals de vacances Oderen avec photos, disponibilités et descriptifs détaillés. Chalet in a property in mountain area with 6 bedrooms, dining room, living room, mezzanine, kitchenette, 1 bathroom, 5 shower rooms, 6 WC. Pets allowed. Number of beds: simple bed (7), sofa bed (4). Large cottage Jonquille in Alsace : a quiet haven with plenty to do in the cottage and on the doorstep. Wellness area Heated indoor pool, hammam, sauna, spa Can be used all year round. | NEW in option : oudoor spa and Finnish Grill House Spacious and Comfortable 6 bedrooms - crib - kitchen - dish washer - microwave - living room - TV - 6 shower rooms - washing maching and drier - terrace Entertainment and games room a tennis table, a shuffleboard, American and French billiard, 3 video ga. Altitude 680m.